Coco is a stunning black brindle with fantastic type. 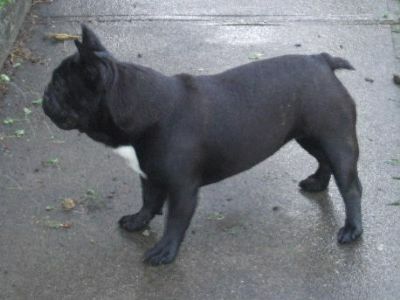 Amazing length of flews, great ears, dark eyes and beautiful Frenchie head. Shiny coat and great personality. After a very sparse show career (Coco hated the show ring so we didn't force the issue), our girl is now retired. Coco is now our matriarch and chief bed warmer. After presenting us with our gorgeous Perle and Buddy, Coco was spayed and will live out her days as our number 1 spoiled girl. 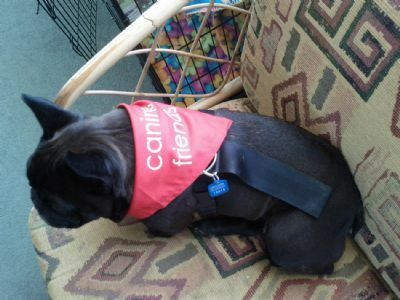 Coco has qualified as a Canine Therapy dog and loves her visits to Chiswick Rest Home every Sunday. We are looking forward to showing Coco's daughter Perle later on in 2012 and Coco will, of course, continue to accompany us wherever we go as she just loves to come in the car and be part of all the action. This girl is personality plus and we just love her ~ thankyou Ian and Kay (Kaayin Kennels) for blessing us with this wonderful girl.